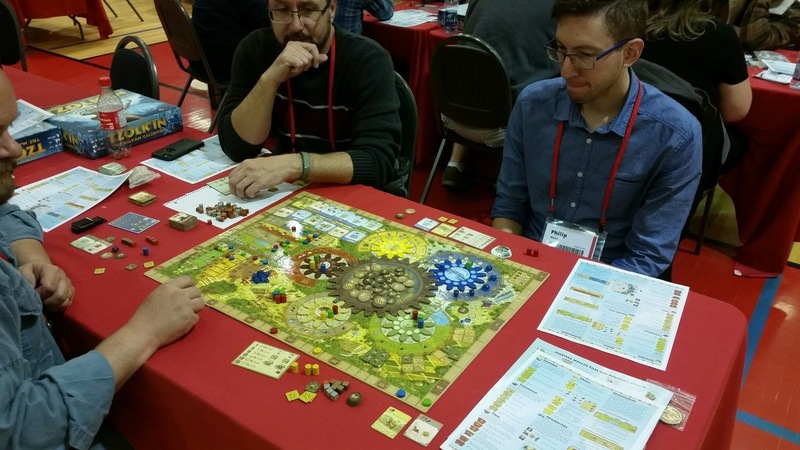 This past weekend I went down to Calgary for Fallcon 30, a weekend of all things boardgaming! The convention this year had moved and was held at the arena at SAIT. I must say, the SAIT campus is really nice. Jonathan and I played Wilderness War. Well, we played the first year anyway. Hopefully we'll be giving this another go soon. The second game of the evening was Tzolk'in: The Mayan Calendar. Two of the players hadn't played in a year and the fourth hadn't played before. I was able to squeak out a win in the this one with the new player being close behind. Steve Zanini, the gentleman running the game, was kind enough to have had keychains made for everyone who participated. The keychains have a small wood Mayan calendar on them. Saturday morning saw me participating in a playtest of a game called Defenders of Wessex. In this game the players are defending Wessex against constant Viking attacks. The game was in the vein of Pandemic, a cooperative game where the players are desperately trying to stave off panic in the countryside all the while scrambling together enough forces to destroy the Vikings. We ended up losing the game. I hope this game makes it as it was an interesting, entertaining game. For the afternoon, both Jonathan and I did not have a game so we pulled out Commands and Colors Napoleonics. We played one of the scenarios from the Russian expansion: Borodino: Shevardino Redoubt. 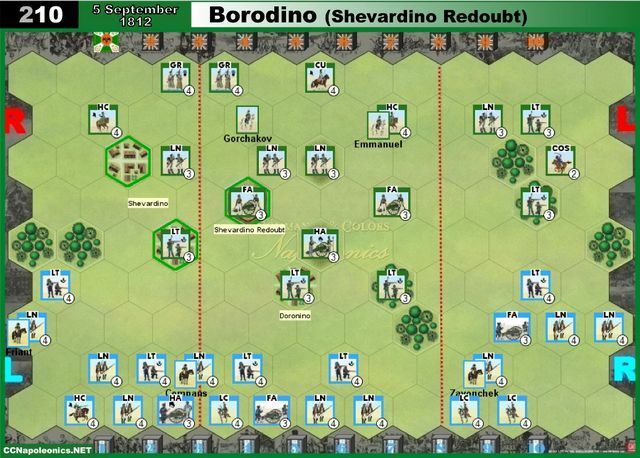 I played the Russians and was able to keep the French at bay till they finally got moving and then they quickly rolled over me. I need to get this game out more. And next up was the most anticipated part of the weekend: the auction! As in previous auctions, there was an excellent selection of games up for bid. I was able to get a number of the ones I was interested in. Now, I need to get them to the table! 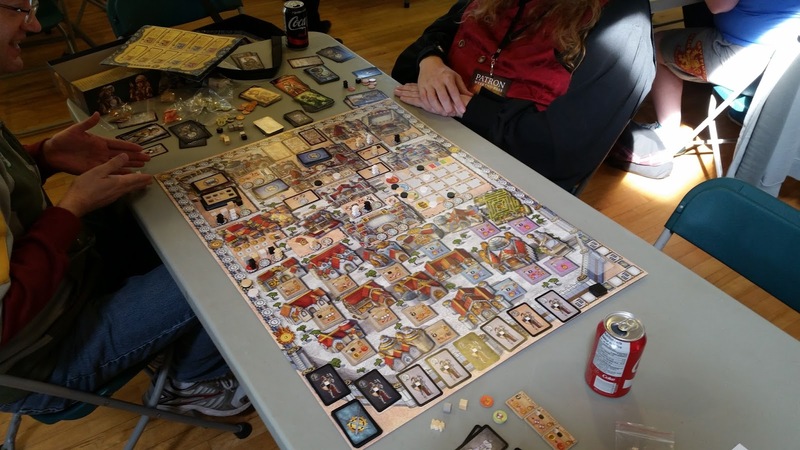 After the auction, I played in a game of Mansions of Madness 2nd edition. I wanted to give this game a try to see how it compared to the 1st edition. The game seemed to flow a little smoother, but I have to say I do prefer the 1st edition where one of the players is against the rest of the players. Sunday started with the flea market and I was able to pick up two more of the scenario packs for Mansions of Madness 1st edition for a great price. Besides that, there wasn't really anything else that grabbed my attention. After that was the last game of the weekend: Formula De. There were 8 people playing and we were racing on one of the tracks in Italy (can't remember which). Really fun game and a perfect convention game. We'll have to see if we can get the guy who ran it to come up for Mayday. I'm redoing my upstairs flooring now, so it'll be a while before anything comes off the paint table. 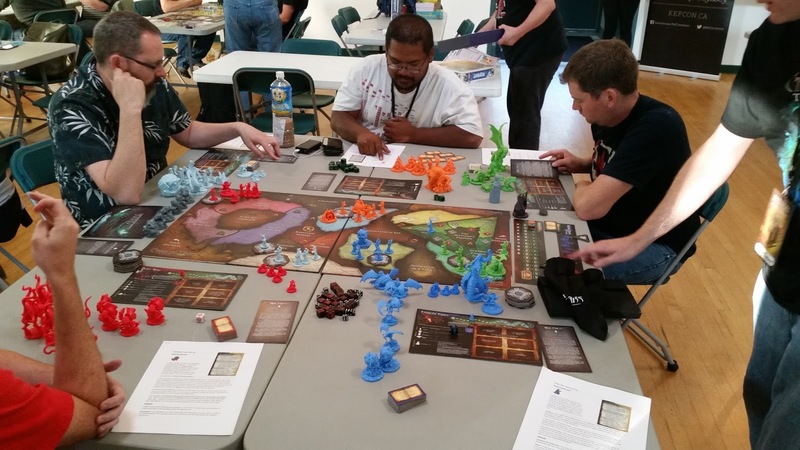 This past weekend I attended the 3rd annual Kefon boardgame convention. This was the first Kefcon I've attended. It was held at the Queen Mary Park Community League (near to Kingsway mall and NAIT). The facility was pretty nice. I played Nyarlathotep and was unfortunately surrounded so I had a slow start. I ended up coming in 2nd or 3rd (can't remember) out of 5 players. I had never played the game before but it seemed kind of interesting. Basically it's a worker placement game. I had a bad start and my starting cards were poor and never got used. I ended up getting squashed in this one. 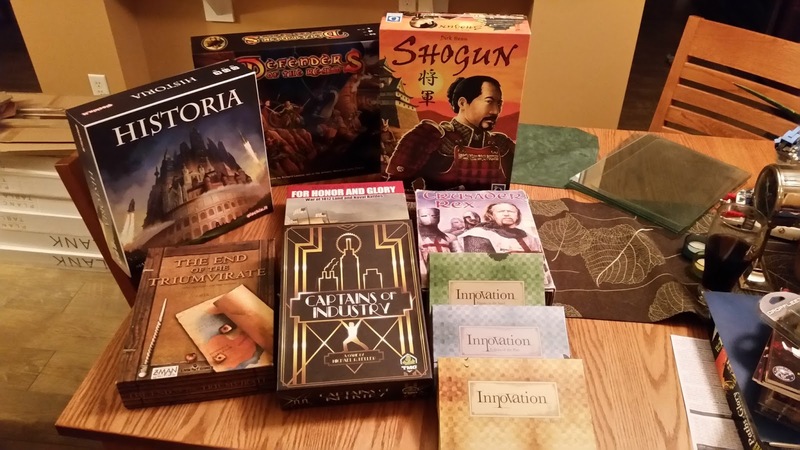 There was a couple games that I've had on my radar and have been interested in trying out. 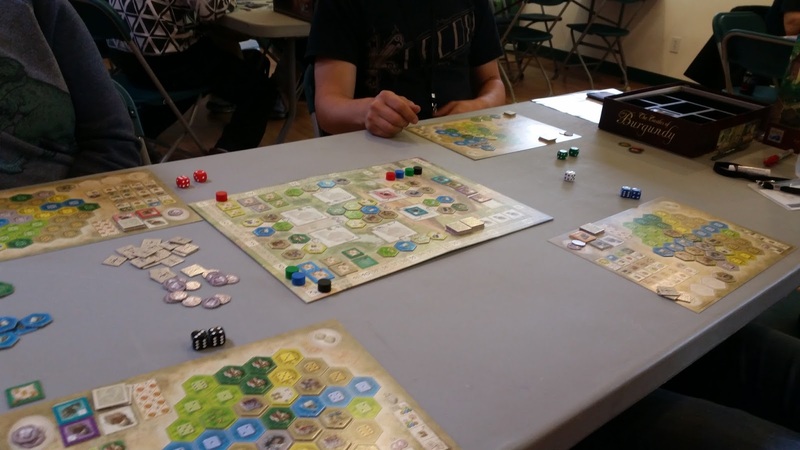 Castles of Burgundy was one of these games. Out of the four players, if I remember correctly, I was the only one who had never played before. In the game you collect tiles to add to your personal board. Adding tiles lets you do various functions. Early on I trailed the other players but by the end I was middle of the pack. Because I had picked up a number of end game scoring tiles, I ended up getting a pile of points at end-of-game scoring and won quite handily. 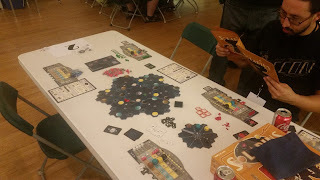 Originally I was going to play Eclipse but as there were only two of us (Craig and myself) we opted to play something else. Two-player Eclipse isn't really any good. Craig had brought out Archon in case another game was needed. 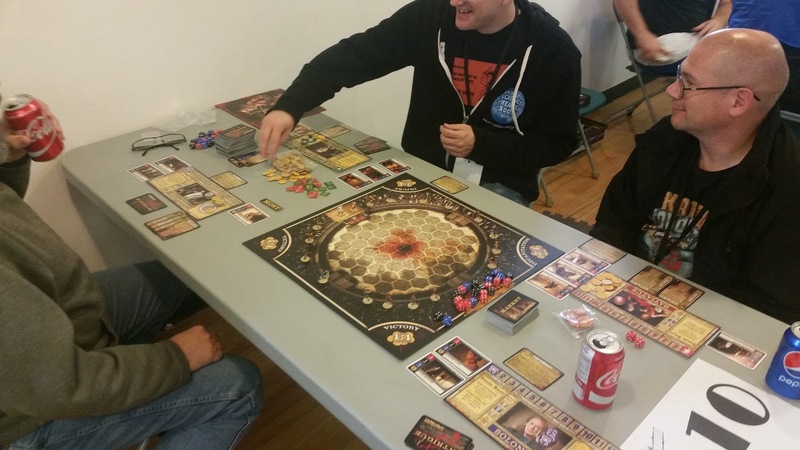 Archon is a worker placement game with a clockwork steampunk type setting. I ended up winning this one. Because Eclipse was a two player slot, once Archon was over I needed to find another game to fill the time. I got in to a game of Zombicide: Black Plague (sorry no pic!). It was the intro scenario and we won quite handily. 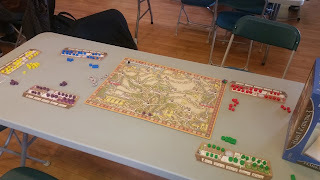 Once that was finished I had an hour or so till the auction, so I got into a game of Diceborn Heroes (sorry no pic!) being run by the games designer. This game is a anime-style cooperative fantasy game where the heroes work through a trio of quests to finally fight a boss monster. It was a pretty fun little game and I may pick it up if I get a chance. Next up was the auction and I came away with a trio of games. I got the Yellow Sign scenario pack for Mansions of Madness 1st edition. As Fantasy Flight is now on 2nd edition, it's getting hard to find the packs I don't have. I think I'm still missing three scenario packs. I also picked up Subdivision from Bezier Games. I really like their Suburbia game so I wanted to get my hands on this. I also won a copy of T.I.M.E. Stories. The impression I had is that it's pretty well thought of, hopefully I can get this to the table soon. After the auction I was supposed to get into a game of Eldritch Horror but the GM was sick so the game was cancelled. I ended up getting into a game of Solarius Mission. This game apparently is unavailable in North America at this time. This game is a worker placement retro space exploration game. It seemed actually quite complicated for a euro-style game. I ended up getting crushed in this game. The convention also had a bunch of draw boxes for games that people could put purchased tickets into. I bought a few and put them into the draw box for Concordia. I ended up winning a copy of the game. This was the other game that I have been meaning to try out. This is a worker placement type game where you place your pieces on roads between cities to try and complete the said roads. You're constantly having to knock off other players pieces from the routes you want( kind of aggressive for a euro!). I was the only one of the four players who had never played the game and I ended up winning narrowly. This is a great game and of the four players only one of them had never played. I'll pretty much get into this game whenever I can. We played a full long game and I ended up winning this one. Overall it was a pretty fun (and tiring) weekend. September is a busy (and expensive!) month. 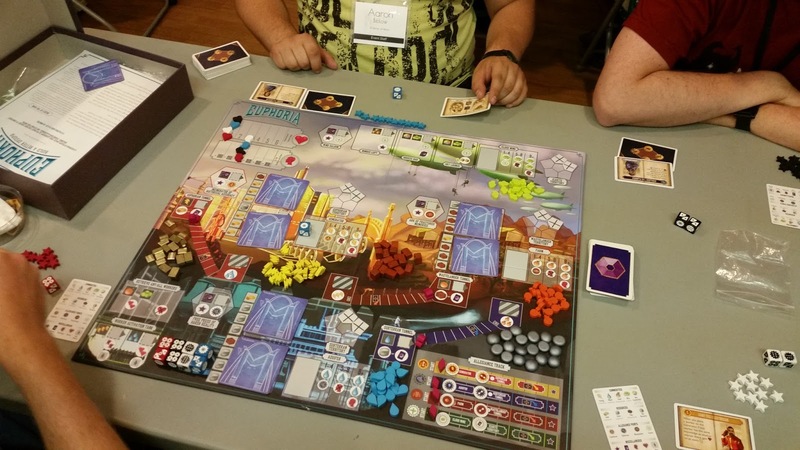 Fallcon in Calgary is in three weeks and Gamealot is on the following weekend in St. Albert. I'll also be playing my first game of Dropfleet on Tuesday at the club's new digs, Red Claw Gaming.